Looking N from I-64 near 29th St.
Each of the three locks at McAlpine Locks has a visible yellow stripe along the top of its far wall. Nearest to the camera is the 600-foot lock (completed in 1921); one of its open lower gates can be seen at left. 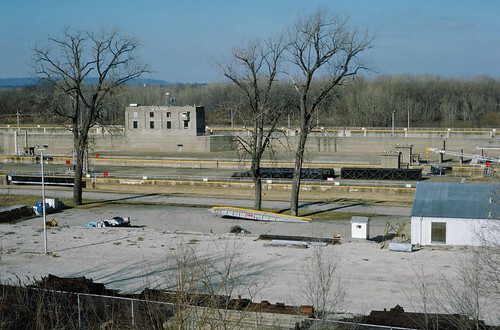 Next is the decommissioned 360-foot lock (completed in 1872, though modified since then); its closed upper gates can be seen at right, beyond the metal-roofed building, and at far right, just below the red fire hose box, is the permanent bulkhead installed when the lock was closed for good in 1970. Farthest from the camera is the 1200-foot main lock (completed in 1961); the first towboat to lock through was the "Philip Sporn" (doc. # 274333). A history of the canal, locks and dam on the Ohio River at Louisville can be found at Triumph at the Falls: The Louisville and Portland Canal (free PDF). Plustek OpticFilm 7600i and Silverfast 8.